Well, I may as well make it official… I haven’t really felt inspired to draw for some time now, and I have some other projects that I’ve been really into lately, so I’m going to take a bit of a paperdoll vacation. I’ll post if I happen to feel like drawing something, but I won’t stick to a schedule. I’ll come back, because I always do, but I couldn’t say when; I am thinking probably within a couple of months. If you’re wondering if I’m still alive, your best bet is to check my Twitter feed. (But I don’t lead a dangerous life, so there’s no need to worry!) Thank you all for your patience with me, and check back in a while! We’ll sure miss you, but have fun pursuing other fun things! Have a good paperdoll vacation, and come back with lots of ideas! We will miss you–your paper dolls and their lovely outfits are cherished by my granddaughters and myself. I hope you have a marvelous vacation, and hope you will eventually return to us! Thank you for all the beautiful dresses–may you have as much happiness as you have brought to all of us! Awwwwwwwwwwww. Have a nice paperdoll vacation. I’m gonna miss seeing your drawings, but I can’t wait til you come back. Oh, wow. We’ll miss you! But have a great vacation! I know I’ll be checking weekly to see if you come back! But this dress is really pretty. I like the simplicity of it all. I’ll miss you Liana! Have a good vacation! This gown is on of my favorites! Will really miss you and your art. Come back soon. We’ll be here when you come back. Beautiful dress, too. Awww, well have a good paperdoll vacation, we’ll be waiting anxiously for you to get back. We’ll always be here lol :)I’m gonna miss your drawings soo much! BTW: This is such a gorgeous gown, love it! awww…. we’ll miss you, but maybe you can pop in with a costume for when the last harry potter comes out on the 15th? its in less than a month… but maybe you can make a tiny exception. but have fun on your break and come back whenever you feel you can. BTW, i love this dress, it’s SO pretty. I see this dress and I think ‘The Ultimate Wedding Dress’!!! We will miss you, Liana!!!! This is an awesome dress i love it,it is something that looks like it is for a mermaid. ha ~ go figure! i finally get back online and you’re going to be off. hope you have a fabulous break ~ i will enjoy catching up. *chuckle* I find you this year, with lots of inspirations to make into 3-D outfits for me or my BJD or little girl and now you might not be around for a while. These are lovely and some of your originals I’d love to make and wear at SF conventions. Hi, have just found your blog. I’m a family day care mum, and your paper dolls have been a great hit! Our theme at the moment is “Under the Sea”, so your mermaid and pirate outfits are wonderful. Iv’e been puting photo’s of the kid’s heads on your dolls and they love it! If your in need of inspiration, the kids have been asking for a merman with outfits….and also as Halloween is coming up, I’d love to have some witch and wizard outfits for their dolls. As a home day care mum it is sometime hard to come up with new activities for the kids. Your dolls are now being used by over 50 Day care mum’s in my area… as upon showing them your doll’s at our new idea’s meeting, everyone is singing your praises. Thankyou. sooo…when do you think you’ll be back? Who’s excited for Harry Potter?! I am!!! Um, Liana, please come back! ! ! ! Hurry and draw more, we so enjoy you! ! ! 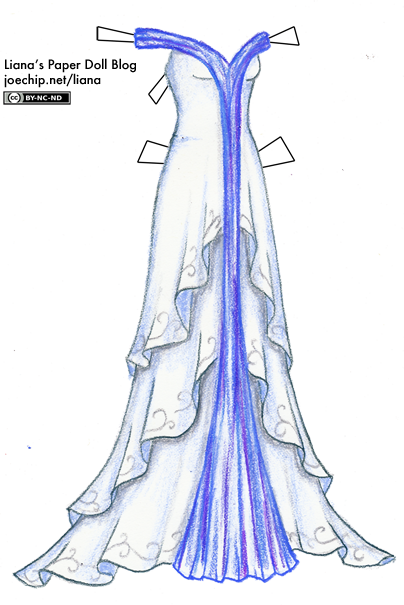 Maybe you could do dresses based of of the Percy Jackson books!!!!!! You could draw Thalia (the tree), Annabeth (daughter of Athena), Medusa (the Gorgon), or Sirens (the creepy mermaids that eat you). You could also do Greek gods and goddesses! Athena (goddess of war), Aphrodite (goddess of love and beauty), Hera (goddess of the home and peacocks), or Artemis (Goddess of wild animals). I’m agreeing with the Percy Jackson idea. i heard that they are making another movie……. I think that the nation idea is cool! i also think that a whole twilight thing would be very popular! when are you comeing back?!?!?! it’s been MONTHES!!!! I live in Australia although I am english and have just found your amazing site.You are an extraordinary talent and should print and sell paper doll books — or do you? Is this the right place for this communication? I wanted to get in touch but couldn’t find an email address. Where do I find the dolls? I intend to put magnetic tape on the dolls and dresses to decorate my fridge. They are so beautiful I want to look at them all the time. I think I will frame some too. Please do not go anywhere now I have found you. Thank you for sharing your talent. I have loved paper dolls all my life and have quite a collection –I am pretty old and love computers and the net and especially digital books. @Carmel Scott if you look on the right hand side you should see a link saying dolls, in Categories. Liana does have a wonderful site but as you can tell she is currently taking a break. :c However the old dresses and costumes are still there and they are truly great so have fun cutting, pasting, colouring and exploring. I really like all the Percy Jackson ideas :) I’ve also been thinking…. you should do Star Wars dresses like Princess Leia, Queen Amidala, and Padme. That would be awesome! I agree with Kenzie!!!! And when r u going to come back Liana? Liana please come back I come here every sad and get so sad that you still havent come back yet we miss you! Hurry back! I want to look at more dresses! Star wars and Percy Jackson…… two of my favorite things on EARTH!!!!!!!!!!! I love the Padme idea…. she has so many GORGEOUS gowns that Liana would be working for a while until she was done! I know. Star Wars is awesome :)She could even try to make the crazy but really cool hairstyles that Queen Amidala has. That would be so cool. Hard too, but she could do it! AHHH! tomorrow I have a star wars dress up day at my school……. what should i do? I am not allowed to bring any guns or lightsabers….. WHAT DO I DO! I know you said in your most recent post that you thought you did poorly on this dress, but I love it!! By the way Emma and Kenzie, I love star wars and percy Jackson too!